Are you excited for the upcoming Flash big episode on April 14th "All Star Team Up" we've seen glimpses of what to come and it looks amazing. Team ups with Arrow, Firestorm, The Atom possibly even Cisco donning the Vibe costume. All this with other nods to greats like Gorilla Grodd, The Rogues teaming up, more of the fight between The Reverse Flash and what we know is an 'older' Flash. The battle between those two of course is yet another pull straight from the comics and while that should be the main focus of this show we're seeing some ties to some other source material as well. When John Wesley Shipp was announced as playing Barry's father, Henry Allen, Flash fans rejoiced, bringing in the original show's Flash to play the new Flash's father was a stroke of genius. In December's episode The Man in The Yellow Suit we are introduced to Dr. Tina McGee a former employee of S.T.A.R. Labs played by Amanda Pays reprising her role as the doctor who helped Barry during his 1990 adventures. Finally with the Trickster episode that just aired we have Mark Hamill returning as The Trickster and Officer Morello returns as the Mayor Central City. With the Trickster we're told that the he was a criminal years ago who was responsible for killing hundreds of people back in the 90s. Now while it's one thing to throw in some Easter Eggs here and there as fun little nods to the original show the new Flash is doing more than that, they have two characters reprising their roles. Are these cute things to throw us old fans, or are they something more. Here is my Flash Theory based on what we've recently learned, let's put some facts on the board first. 1. Eobard Thawne traveled back in time to kill young Barry, but... it wasn't Harrison Wells. 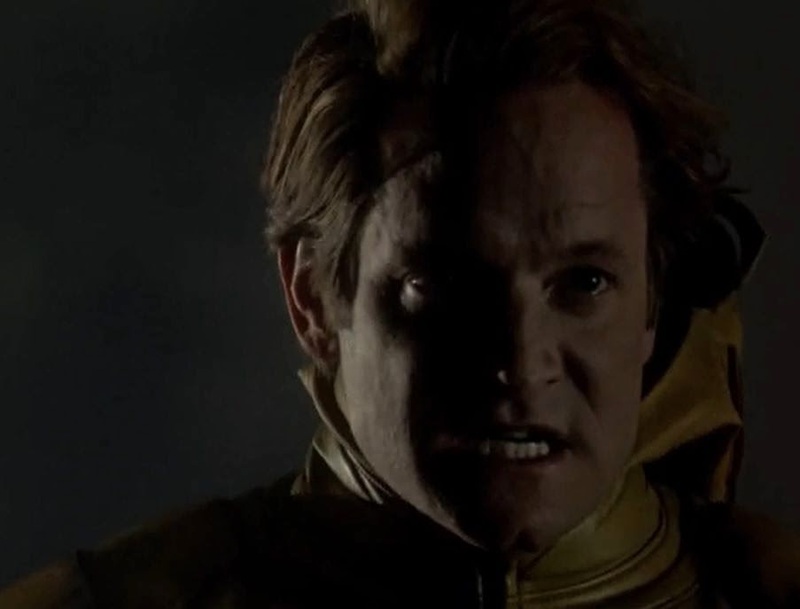 We see Thawne in the last episode of The Flash remove his mask to show his true face. That of the future's Eobard Thawne. adult Flash. Also in case you didn't catch it, the costume the Flash was wearing in the fight we've seen in the previews is not the same leather suit Barry (Grant Gustin) is currently wearing. We see his emblem has a white background and his legs have yellow bolts down them as well. This means our Barry that we are watching is not the same Barry who is fighting Thawne in the past. Let's take these clues and combine them with the other facts the show has shown us along with some timeline work. 2315 - Eobarde Thawne has expressed he is centuries ahead of us, so I'm assuming he's from lets say 300 years in the future, and for some reason he hates Barry Allen and wants him dead. 2020 - Thawne tells Wells that he creates the particle accelerator in 2020, but he needs him to create it sooner. This must still give birth to the The Flash then as Thawne knows of him, so an older Barry becomes the Flash and may explain the different costume. 2015 - Now - Barry Allen becomes the Flash and knows the man in yellow killed his mom. So this Barry has been affected by time travel and the time line we know has already been played with by Thawne. 2000 - Young Barry is saved by older Barry, but his mother is killed during a fight between Thawne Reverse Flash and The Flash. It's important to note that its not Wells Reverse Flash that attacked young Barry. Wells becoming Reverse Flash is now new to this timeline. The Trickster is stopped and kills no one. Here's my theory based on what we've seen. Thawne we see loses his connection to the speed force in the past and loses his powers, this is because Barry leaves that time period. But where is Barry? What if, after he saves his future self he can't slow down and continues to travel back in time in to the past, year by year trying to stop but each year he runs back ages him a year. So what would Barry Allen look like 10 years older than an even older Barry, whom is fighting Thawne? Possibly much like his dad? Barry is running and finally comes to a stop, panting, out of breath, he stands up and we see his face and he has aged to the point of actually looking just like his dad, John Wesley Shipp. Because he's stopped he has lost his connection to the speed force and feels his powers fading, along with possibly his memories of the future as the time line has been altered and he is now a time anomaly. In order to connect to the speed force again he tries to recreate the lightening strike(as we saw Barry do in Flashpoint in comics) and it works, however, it causes him to forget the future, thus we are given the 1 year series. Essentially this is the lost first episode of the Flash series. This connects Tina McGee, Mayor Morello, and explains why the Trickster never killed anyone, because now the Flash was there to stop him. One more lost episode, the true final episode of the 1990 Flash series, Barry is struck by lightening again and in doing so it has amped up his powers, reconnected him to the speed force and bolted back through time. This time, back to the future, as he runs through he stops Thawne from absorbing Wells, and bolts himself all the way to the year 2015 where he merges with his 20 something self and returns to being the Barry (Grant Gustin) that we know. Sound a little far fetched? Maybe, but it is a show about a guy who can run so fast he can vibrate through solid objects. This also ties all of the nods to the original series back to the current, we get Amanda Pays to come back one more time, this time with the memory of assisting Barry in his crime fighting adventures. Don't know if this is where it's going, but it sure would be a fun run if it did.